In the wake of the 1910–20 Revolution, Mexico emerged as a center of modern art, closely watched around the world. Highlighted are the achievements of the tres grandes (three greats)—José Clemente Orozco, Diego Rivera, and David Alfaro Siqueiros—and other renowned figures such as Rufino Tamayo and Frida Kahlo, but the book goes beyond these well-known names to present a fuller picture of the period from 1910 to 1950. Fourteen essays by authors from both the United States and Mexico offer a thorough reassessment of Mexican modernism from multiple perspectives. 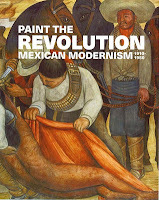 Some of the texts delve into thematic topics—developments in mural painting, the role of the government in the arts, intersections between modern art and cinema, and the impact of Mexican art in the United States—while others explore specific modernist genres—such as printmaking, photography, and architecture. This beautifully illustrated book offers a comprehensive look at the period that brought Mexico onto the world stage during a period of political upheaval and dramatic social change.